With hazards, hills and beautiful scenery, Staunton Country Club provides golfers with challenging holes and lots of excitement. From battling the water hazards to maneuvering around the trees, you are in for a treat when you play a round on this challenging 9-hole course. The course starts with a bang with a water hazard on the first hole. You have to navigate a tee shot over the lake and avoid the lateral water hazard that is over the fence and behind the green. Don’t worry if you don’t make it over the water. Use the designated drop area at the east of the fence and add a stroke to your score. You need pinpoint accuracy to master this hole. With out of bounds areas to the left, behind the green and in the road, this hole does not leave room for mistakes. The hole also doglegs to the left, adding to the challenge. Use precision as you move toward the pin, or you will end up adding strokes to your score. The third hole is a straight away, but it still comes with its own set of challenges. Watch out for the out of bounds areas on the left and behind the green. Also, be mindful of the trees that surround the green. Stay on course and head for the pin. Make your way down the tree-lined fairway as you head to the green. With no out of bounds area, the entire fairway is yours for the taking. Drive your way to the hole and follow the slight dogleg to the left. As you head toward the hole, be mindful of the out of bounds areas to the right and behind the green. Follow the slight dogleg to the hole and carefully maneuver over the ravine that divides the par four fairway. Get ready for a challenge on hole 6. The hole may be a straightaway, but the hills make it anything but simple. Climb up and down the hills as you move toward the green. The hills are not the only concern on hole 6. The area over the fence behind the green is played as a lateral water hazard. Use the drop area at the south end of the fence. Admire the tree-lined fairway as you take out your club and drive toward the green. Avoid the out of bounds areas on the left and behind the green, or you will end up adding to your score. Also, be sure to follow the dogleg to the left. The eighth hole provides a straight shot to the pin. Even with a straight shot, the hole has a variety of challenges. Watch out for the creek in front of the green, as well as the out of bounds area on the left. In addition, trees border the hole. Don’t let your ball get lost in the trees, or you could end up taking some difficult shots. Before you can make it back to the clubhouse, you need to rise to the challenge of the ninth hole. 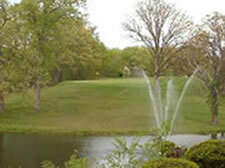 A lateral water hazard sits to the right of the fairway and a creek sits in front of the tee. In addition, there is an out of bounds area to the left. If the water gets the best of you, use the drop area at the west end of the hazard.